The Suzuki Vitara is a compact SUV produced by Suzuki in four generations since 1988. The second and third generation models were known as the Suzuki Grand Vitara, with the fourth and current series eschewing this prefix. In Japan and a number of other markets, all generations have used the name Suzuki Escudo. The original series was designed to fill the slot above the Suzuki Jimny. The first generation was known as Suzuki Sidekick in the United States. The North American version was produced as a joint venture between Suzuki and General Motors known as CAMI. The Sidekick was sold in various badges such as the Geo Tracker (Chevrolet Tracker beginning 1998 model year) in the United States, and as the GMC Tracker, Chevrolet Tracker, Asüna Sunrunner and Pontiac Sunrunner in Canada. It was also sold as the Santana 300 and 350 in Spain. In the Japanese market, it was also sold as the Mazda Proceed Levante. The second generation was launched in 1998 under the "Grand Vitara" badge in most markets. It was accompanied by a still larger SUV known as the Suzuki XL-7 (known as Grand Escudo in Japan). The third generation was launched in 2005. The fourth generation, released in 2015, reverted to the original name "Vitara" in most markets, but shifted from an off-road SUV towards a more road-oriented crossover style. It shares the platform and many components with the SX4 S-Cross, a compact crossover in a similar class. Escudo was first introduced in the Japanese domestic market in July 1988. The name is derived from the "escudo", the monetary unit of Portugal before adoption of the Euro. North American Sidekick became available for model year 1989 as a two-door convertible or hardtop. A fuel injected 80 hp (60 kW) 1.6-litre, eight-valve, four-cylinder Suzuki G16 engine was available on the JX and JLX. 1990 brought the deletion of the upscale JLX version. A carburetted version without a catalytic converter was available for some markets; this model produces 75 PS (55 kW) at 5250 rpm. In August 1990, the Japanese market received a sixteen-valve version with 100 PS (73.5 kW) as well as an optional four-speed automatic. At the same time, the commercial Van version was discontinued. Three months later a five-door version with a lengthened wheelbase was introduced; it was sold as the "Escudo Nomade" in Japan. It was thought that the five-door would overlap with the shorter three-door in the market; instead, it appealed to a whole new segment and sales in the domestic Japanese market doubled as a result. 1991 brought the introduction of rear antilock brakes. European deliveries of the five-door version began in the summer of 1991. In December 1994, a 2.0 V6 (Suzuki's first six-cylinder) and a 2.0-litre Mazda-sourced turbodiesel were added; in return, Mazda got to sell the Escudo in the Japanese market as the Mazda Proceed Levante. A diesel option arrived in Europe in early 1996. In 1996 the Vitara received a facelift, which meant that the V6 was upsized to 2.5 litres while a 2.0-litre four-cylinder was slotted into the range. In Japan, the "Nomade" tag was dropped from the five-door Escudos. 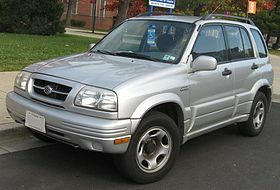 For the 1996 model year, Suzuki introduced the Suzuki X-90 which was mechanically identical to the Escudo/Vitara but had a much rounder body, a trunk, and removable T-bar roof. The Suzuki X-90 disappeared from Suzuki's lineup after the 1998 model year. The Sport variant was replaced by the Grand Vitara in 1999. In Australia, there were two models available. The Vitara JX and the Vitara JLX. The JLX offered powered windows. Both versions featured the 1.6 Litre engine. In May 1997, Suzuki introduced the 1995 cc 2.0 Litre 4 Valves/Cylinder Double Overhead Cam engine with both soft-top and hardtop three-door models. This engine was rated at 97 kW (130 hp) at 6300 rpm. At the same time the five-door models received the 1998 cc 2.0-litre V6. Engine power rated for the five-door V6 models was at 100 kW (134 hp) at 6500 rpm. The 1.6-litre variant for the three-door models were named the Suzuki Vitara Rebel. All models in Australia were sold as four-wheel drives. In Indonesia Suzuki only sold the five-door model, first introduced as the Vitara in 1992. Suzuki added a two-wheel drive version labelled Escudo in 1994 to target the urban-driver market and to evade higher taxes on four-wheel-drive vehicles, while the four-wheel-drive Vitara remained available. In 1996, Suzuki introduced the Sidekick, a down-specced version of the Escudo, as the entry level model. Indonesia is the only market in the world which received all three different names of the Escudo. Later, only 5-door models with the 1.6-litre petrol engine were offered, with no automatic transmission. In 1995, the Vitara received fuel-injection system and marketed as Vitara EPI (Electronic Petrol Injection). However, due to much higher price, Vitara EPI sold poorly in the market and later considered become collector item since its rarity. For also 1995, the Vitara got new interiors. Official production for this generation ended in 2006 with the end of the Santana 300/350. In Norway, a modified version of the 5-door version with a taller glass fibre roof were sold with green van registration plates which meant lower tax. These models had no rear seats and a grille between the front seats and the rear compartment. Many of these were converted to 5-seat passenger cars with normal registration plates. . All Vitaras sold in Norway had a modification done on import to have the low beams automatically turn on with the engine running, similarly to DRLs on the CAMI versions of the car. In the United Kingdom, some 2-door models were sold with wider wheel arches, 8-10 inches wide alloy wheels, Cooper Cobra tires, extra styling options like sidesteps, bullbar and auxiliary high beam lights as the Suzuki Vitara Fatboy. Suzuki announced the second-generation model on 18 January 1998 for 1999. Slightly larger, pricier and more powerful, it used a light-duty automobile-type rack-and-pinion steering box instead of the recirculating ball truck unit used in the first generation. The three-door version remained in the mini SUV class while the five-door version moved up to a compact SUV. In most international markets the name "Grand Vitara" was adopted. In many markets it was originally only available with larger (two litres and up) engines while the earlier Vitara was still available. In the United Kingdom, a 1.6-litre Grand Vitara (the GV1600) arrived in early 2001. It was facelifted in for 2002 and again in 2004. A rebadged version was sold in North America by General Motors as the Chevrolet Tracker. The Tracker is sold in Latin America, excluding Mexico, as Chevrolet Grand Vitara. In Mexico, Grand Vitara and Tracker are different vehicles, sold by Suzuki and Chevrolet respectively. In Chile, the five-door Grand Vitara was known as Grand Nomade. In Japan, an OEM deal with Mazda meant that the wagon was also sold as the Mazda Proceed Levante. As of 2003, the smaller Suzuki Vitara has been withdrawn from the North American market. Sales were slow, with just 4,860 sold in 2004 for the United States. In Canada, sales were strong. All North American Vitaras were built at CAMI Automotive in Ingersoll, Ontario and in the Riverside facilities. The soft-top was only built in North America, with European export models assembled in Canada. The three-door wagon was brought in from Japan for European buyers and sold alongside the Canadian-made convertibles. The 2001 model Suzuki Grand Vitara comes standard as a 2.0-litre 4WD vehicle in New Zealand. In 1998 The Grand Escudo arrived, a longer, slightly larger, pricier and more powerful version of the regular five-door. The Japanese market Grand Escudo was sold in North America and Chile as the Suzuki XL-7. In Australia and Europe it was marketed as the Grand Vitara XL-7. An all new redesigned Grand Vitara (called Escudo in some markets) was introduced for the 2005 model year. The third generation received significant changes over the outgoing model. The ladder-frame construction was replaced with unibody construction which featured a unique built-in ladder frame to improve stiffness and ground clearance while also reducing the floor height. The outgoing models front MacPherson strut suspension was retained while the rear solid axle was replaced with a fully independent multi-link suspension. Depending on the market, engine options included a 1.6L inline four (125hp), 2.0L inline four (156hp), 2.7L V6 (185hp) and a 1.9L Renault-sourced diesel engine (127hp). The engine and transmission are longitudinally mounted unlike most front-wheel drive based compact SUV's in its class. Engines are available with either a 5-speed manual or 5-speed automatic transmission. The Grand Vitara is available in both rear-wheel drive only models (for the Australian market) or with a 4-mode all-wheel drive system. The most widely available Escudo is the 5-door version, but a three-door version is also available in some markets. In some markets the three-door variant drops the "Grand" to be branded simply "Vitara". In some countries, including Chile the 5-door version is named "Grand Nomade". A commonly held misconception is that the third generation Grand Vitara is related to the GM Theta platform. The two are completely unrelated and were developed separately by GM and Suzuki and share no components. In the second half of 2008, the Suzuki Grand Vitara was given a facelift and two new engines. A Suzuki 2.4L inline four is offered producing 124 kW (169 PS; 166 hp) of power and 221 N⋅m (163 lb⋅ft) of torque. The previous 2.7L Suzuki V6 is replaced with a GM-sourced 3.2L V6. The V6 is only offered in the flagship prestige model which produces 172 kW (234 PS; 231 hp) of power and 289 N⋅m (213 lb⋅ft) of torque. Fuel economy has also been improved with the addition of VVT to both engines and the 1.9L Turbo-Diesel has also received some mechanical work improving its economy. Safety has also been improved with more air-bags and traction control being standard on all models. The four mode four-wheel-drive system is also available on all models. It features a lockable central differential along with low ratio gears. Subtle improvements were made on the exterior of the car such as indicators in the door mirrors and a more pronounced front grille and bumper. The interior also saw a lot of more aesthetically pleasing changes. In the second quarter of 2012 for the 2013 model year, Suzuki unveiled a facelift Escudo with new wheels, a new grille and front lights. The V6 engine was discontinued from here on. Starting with this facelift, the Grand Vitara in Indonesia is now a rebadged Escudo, imported from Japan. Suzuki officially discontinued the third generation Escudo in Japan in April 2017 (however it will continue in production for export). In Indonesia, the third generation Grand Vitara was discontinued in 2018. It is also no longer available in Europe, CIS countries and SE Asia. It is no longer listed on the Suzuki Philippines website, as of January 2019, which indicates it is no longer available there. In Iran, it is still being produced by IKCO, only with the J24B I4 engine and a 5-door body style. It is also still offered in Australia , Bangladesh , Bolivia , Burkina Faso , Cameroon , Central African Republic , Chad , Chile , China , Colombia , Congo , Costa Rica , Democratic Republic of Congo , Ecuador (through Chevrolet), El Salvador , Equatorial Guinea , Guatemala , Honduras , Jordan , Kenya , Kuwait , Lebanon , Mongolia , New Zealand , Nicaragua , Panama , Oman , Peru , Qatar , Saudi Arabia , Senegal , South Africa , Tanzania , United Arab Emirates , Uganda , Uruguay  and Yemen  as of January 2019. There are currently four different engines available, being the 1.6 L M16A I4 (petrol), 1.9 L F9Q I4 (diesel), 2.0 L J20A I4 (petrol) and 2.4 L J24B l4 (petrol). The transmission choices are a 5-Speed Manual or a 4-Speed Automatic Transmission (depending on engine and market). Some markets do not offer the 5-Speed Manual, and only offer a 4-Speed Automatic. The 1.6 L M16A I4 (petrol) is available in the Base-spec 3-Door version in Bolivia, Chile, Colombia, Kuwait, Peru, Qatar and Saudi Arabia. The Base-spec 5-Door also has this engine in El Salvador. This engine is only available in conjunction with a 5-Speed Manual. The 2.0 L J20A I4 (petrol) is available in the Base-spec 3-Door form in Uruguay. The Base-spec 5-Door version also has this engine in Bolivia, Burkina Faso, Cameroon, Central African Republic, Chad, Congo, Democratic Republic of Congo, Ecuador, Equatorial Guinea, Gabon, Gambia, Ghana, Guinea, Guinea-Bissau, Madagascar, Malawi, Mali, Mauritania, Niger, Qatar, Sao Tome and Principe, Senegal and Uruguay. This engine is only available with a 5-Speed Manual except for Bolivia and Qatar, where the 4x4 2.0 has a 4-Speed Automatic Transmission available. In Bangladesh, this is the only engine available (in conjunction with a 4-Speed Automatic and a 5-Door body). The 2.4 L J24B l4 (petrol) is available in all countries where it is sold (except for Bangladesh). It is also the only engine available in some markets. In Burkina Faso, Cameroon, Central Africa Republic, Chad, Congo, Democratic Republic of Congo, Equatorial Guinea, Gabon, Gambia, Ghana, Guinea, Jordan, Lebanon, Madagascar, Malawi, Mali, Mauritania, Niger, Oman, Sao Tome and Principe, Senegal, South Africa, Tanzania and the United Arab Emirates, this engine is only offered in conjunction with a 4-Speed Automatic. The 3-Door version is only offered in Australia, (parts of the) Middle East, New Zealand and (most of) South America. In all other countries where it is available, only the 5-Door version is available. The fourth generation of Vitara was presented at 2014 Paris Motor Show. Its production (by Suzuki Magyar) parallels the third generation. It went on sale in Japan as the fourth generation Suzuki Escudo on 15 October 2015. The all-new fourth generation model is 125 mm (4.9 in) shorter, 85 mm (3.3 in) lower, 35 mm (1.4 in) leaner, it is now a subcompact crossover, and has a wheelbase of 2,500 mm (98.4 in), 140 mm (5.5 in) shorter than the previous generation Grand Vitara, making the Vitara easier to drive on narrow roads and tight parking spaces. This new generation of Grand Vitara features a 5-speed manual transmission for the 1.6-litre petrol engine and a 6-speed manual transmission for the 1.6-litre diesel engine. A 6-speed automatic transmission with paddle shifters is also available for the 1.6-litre petrol engine. It has a luggage space of 375 l (VDA), expanding to 1160 l with rear seats folded. Suzuki released a special version of the fourth generation Suzuki Vitara called the Vitara S or Vitara Sport in some markets. The Vitara S features a 1.4-litre turbocharged petrol engine "Boosterjet", which delivers 103 kW (138 hp; 140 PS) and 220 N⋅m (162 lb⋅ft), 20 percent more power and 40 percent more torque over the standard 1.6-litre petrol engine. The engine, shared with the Suzuki SX4 S-Cross facelift 2017, is paired to a six-speed automatic transmission as standard. It was first available in 4WD "Allgrip" only until summer 2016 and after that again since 2017; starting with autumn 2016 the 2WD system is available for the S variant. The Vitara S also comes with several cosmetic changes over other Vitara trim levels including leather/suede sports seats with red stitching, aluminum sports pedals, red LED headlamp surrounds, distinctive five-slotted grille and black alloy wheels. Suzuki unveiled a renewed version of the Vitara at the 2018 Paris Motor Show in milestone of its 30th anniversary in 2018. Changes include a heightened front bumper to give space for the millimeter-wave radar at the front. The conventional digital multi-information display was replaced with a 4.2" colour LCD MID. Like the Jimny and Swift, Suzuki Safety Support was also adopted for the model which includes a collision avoidance system (Dual Sensor Brake Support) and a traffic sign recognition function. In 1998, Suzuki produced the Escudo Dirt Trial for the Pikes Peak International Hill Climb event in North America, which has two twin-turbocharged 2.5-litre V6 engines driving the front and rear wheels respectively. With a combined output of 732 kW; 995 PS (981 hp) at 9000 rpm, this variant has a top speed of 336 km/h (209 mph). It remained four-wheel drive and weighed 800 kg (1,764 lb). It was driven by Nobuhiro "Monster" Tajima. ^ "Suzuki Vitara review". Auto Express. 14 March 2016. ^ a b c Büschi, Hans-Ulrich, ed. (5 March 1992). Automobil Revue 1992 (in German and French). 87. Berne, Switzerland: Hallwag AG. p. 537. ISBN 3-444-00539-3. ^ Anderson, Donn, ed. (April 1993). "Making more out of small cars". New Zealand Car. Vol. 7 no. 17. Auckland, New Zealand: Accent Publishing Cnr. p. 8. ISSN 0113-0196. ^ Alfan, Charis (16 June 2016). "Suzuki Vitara, Escudo dan Sidekick SB416". Mobil Motor Lama (in Indonesian). Archived from the original on 8 May 2017. ^ a b Enright, Andy (31 October 2005). "Suzuki Grand Vitara (1998 - 2006) used car review". RAC Motoring Services. ^ "2006 Suzuki Grand Vitara - 4-Wheel & Off-Road Magazine". Four Wheeler. 1 January 2006. Retrieved 27 February 2018. ^ a b Hyde, Jane. "BUYING USED: SUZUKI GRAND VITARA | 4X4 Magazine". 4x4i.com. Retrieved 27 February 2018. ^ "Al volante del Suzuki Grand Vitara". El Periódico del Motor. 26 May 2009. Archived from the original on 18 January 2014. Retrieved 5 February 2012. ^ "SUV Review: 2006 Suzuki Grand Vitara". Driving. 10 August 2011. Retrieved 27 February 2018. ^ "Suzuki Grand Vitara goes rear-drive". 20 August 2012. Retrieved 27 December 2018. ^ "Grand Vitara - Suzuki Australia". Suzuki.com.au. Retrieved 16 July 2018. ^ "GRAND VITARA 3P". Suzuki.com.bo. Retrieved 16 July 2018. ^ "GRAND VITARA 5P". Suzuki.com.bo. Retrieved 16 July 2018. ^ "Suzuki Grand Vitara 1.6 GLX Sport - Suzuki Chile". Suzuki.cl. Retrieved 16 July 2018. ^ "Suzuki Grand Nomade 2.4 2WD GLX Sport - Suzuki Chile". Suzuki.cl. Retrieved 16 July 2018. ^ "铃木官网 - 汽车 - GRAND VITARA 超级维特拉". Suzuki-china.com. Retrieved 16 July 2018. ^ "Grand Vitara 3 Puertas - Suzuki Autos Colombia". suzukiautos.com.co. Retrieved 16 July 2018. ^ "Grand Vitara 5 Puertas - Suzuki Autos Colombia". suzukiautos.com.co. Retrieved 16 July 2018. ^ "Suzuki - Grand Vitara". Suzuki.cr. Retrieved 16 July 2018. ^ "Grand Vitara - SUV - Chevrolet". chevrolet.com.ec. Retrieved 16 July 2018. ^ "Suzuki El Salvador". Suzuki El Salvador. Retrieved 16 July 2018. ^ "Grand Vitara". Autosuzuki.com.gt. Retrieved 16 July 2018. ^ "Suzuki Honduras". Suzukihn.com. Retrieved 16 July 2018. ^ "The New Suzuki Grand Vitara - CMC Motors Kenya". Cmcmotors.com. Retrieved 16 July 2018. ^ "Suzuki Grand Vitara 2017 Nuevo en Nicaragua - Casa Pellas". Suzuki.casapellas.com. 13 July 2017. Retrieved 16 July 2018. ^ "Suzuki - Grand Vitara". Szukipan.com. Retrieved 16 July 2018. ^ "Suzuki Perú - Suvs - Grand Vitara". suzuki_pe. Retrieved 16 July 2018. ^ "Suzuki Perú - Suvs - Grand Nomade". suzuki_pe. Retrieved 16 July 2018. ^ 3WNET. "SUZUKI GRAND VITARA - Gamme véhicules neufs SUZUKI - CFAO MOTORS - SUZUKI Sénégal". suzuki.cfaomotors-senegal.com. Retrieved 16 July 2018. ^ "Suzuki Grand Vitara- New Suzuki - Suzuki For Sale - Gauteng". Suzukiauto.co.za. Retrieved 16 July 2018. ^ "The New Suzuki Grand Vitara - CMC Motors Tanzania". Cmcmotors.com. Retrieved 16 July 2018. ^ 3WNET. "SUZUKI GRAND VITARA - Gamme véhicules neufs SUZUKI - CFAO MOTORS - SUZUKI Tanzania". suzuki-tanzania.com. Retrieved 16 July 2018. ^ "The New Suzuki Grand Vitara - CMC Motors Uganda". Cmcmotors.com. Retrieved 16 July 2018. ^ "Suzuki Grand VITARA JX". Suzuki.com.uy. Retrieved 16 July 2018. ^ "Suzuki Grand VITARA 2.0". Suzuki.com.uy. Retrieved 16 July 2018. ^ "Nuevo Suzuki Vitara - Salón del Automóvil de Parí 2014". ^ "Suzuki Announces Exhibits for the 44th Tokyo Motor Show 2015". 30 September 2015. Retrieved 25 October 2015. ^ "スズキ、コンパクトSUV 新型「エスクード」を発売". 15 October 2015. Retrieved 25 October 2015. ^ "Suzuki Vitara (2015)". Netcarshow.com. Retrieved 16 July 2018. ^ "Suzuki Vitara Practicality". CarWow. Retrieved 17 April 2018. ^ "Paris Motor Show 2018: Suzuki unveils 2019 Vitara: Why this Creta rival makes great sense for India - The Financial Express". www.financialexpress.com. Retrieved 30 October 2018. ^ "VITARA | AUTOMOBILE |Global Suzuki". Global Suzuki. Retrieved 30 October 2018. ^ "VITARA 30th Anniversary | GLOBAL SUZUKI". VITARA 30th Anniversary | GLOBAL SUZUKI. Retrieved 30 October 2018. ^ "4th Generation 2014- | VITARA 30th Anniversary | GLOBAL SUZUKI". VITARA 30th Anniversary | GLOBAL SUZUKI. Retrieved 30 October 2018. ^ Carbonare, Dino Dalle (18 April 2014). "Twin-Engined & Terrifying: A Monster Suzuki". Speedhunters. Retrieved 18 March 2016. Wikimedia Commons has media related to Suzuki Vitara.